Something you see quite often in the ketogenic diet space is lack of vegetables. Too many carbs can interfere with ketosis, but when it comes to optimal nutrition, veggies should be incorporated on your keto meal plan. They offer a wide variety of vitamins and minerals that will reduce the risk of many nutritional deficiencies. The key is moderation and sticking to low carb options. Cauliflower is not only a great low carb replacement for rice, but is also high in nutrition. It’s part of the cruciferous family, which tend to be lower in carbs as well. Other veggies like broccoli, bok choy, mushrooms, and garlic are wonderful options to incorporate into your ketogenic diet and even sweet vegetables like carrots are O.K. to have in moderation as long as you account for the net carbs you are consuming. The main reason to incorporate vegetables into your diet is the abundance of vitamins, minerals, and antioxidants they provide. These nutrients will help your body run at optimal levels, boost immunity, and also reduce the risk of many chronic diseases. Another component veggies have to offer is fiber. Fiber will help improve digestion and maintain optimal gut health. Vegetables are loaded with fiber which will help keep you more full and satiated. This will allow less chances for overwhelming feelings of hunger and prevent unnecessary snacking which leads to weight gain. Fiber also helps improve metabolism and balance blood sugar. Vegetables typically have a high water content that help to hydrate, nourish, and keep your skin looking youthful. They also contain phytochemicals and carotenoids which are known for their anti-aging effects that help improve firmness and fight wrinkles. 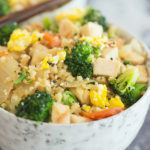 Aside from the chicken and healthy oils used in this recipe, you will also be able to get a load of vegetables in without really even trying. Not only that, you will enjoy eating these veggies so much and probably go back in for another serving. Lightly season chicken breasts with 1/2 tsp of salt, 1/4 tsp of pepper, and 1/2 tbsp of olive oil. Begin cooking chicken on grill pan or pan of choice. Heat a large wok or pan under medium-high heat. Add sesame oil and remaining coconut/avocado/olive oil. Saute onions and carrots together for 2-3 minutes. Add remaining vegetables, salt/pepper/garlic powder, and cook for an additional 2-3 minutes until tender. Add fresh garlic, riced cauliflower, and coconut aminos/soy sauce. Stir well. Add chicken and scrambled eggs. Mix until combined. Turn off heat and stir in green peas. Re-season to taste. Top with sesame seeds if desired.